Tuesday, April 16, 2019: General Membership Meeting, 7:00 p.m. Ever wonder what goes on in that big building across from Coyote Point park? Ever wonder what it would be like to be part of a yacht club? 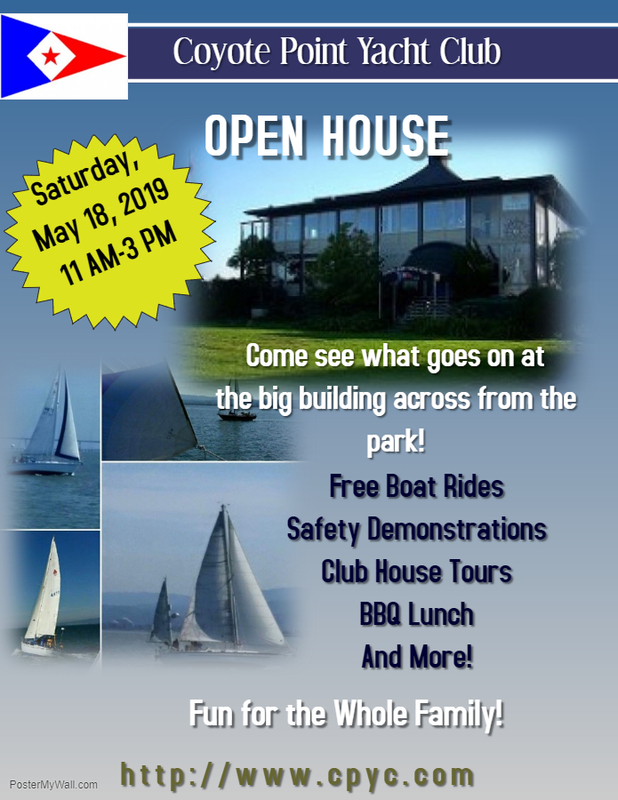 Free boat rides, safety demonstrations boat tours, and activities for the kids. Members will be on hand to talk about the boating experience, and tours of the club house will be offered. A BBQ lunch will be available for purchase for $5. This activity is fun for the whole family. The club is located at 1820 Coyote Point Drive inside the Coyote Point Park. At the park entrance, tell the gate guard that you are attending an event at the Yacht Club. Bar open during dinner hours, and at OD’s discretion during non-dining hours. Special guest chefs and themed dinner events as posted. Reservations for dinner events should be made to reservations@cpyc.com. I have tried calling club and get a recording. I am trying to get the 2019 sticker for my membership card so I may use the Lahiana YC while in Hawaii. Could some one tell me how to acquire this? Stephanie, please email office@cpyc.com about the sticker. I don’t believe we have obtained them yet.